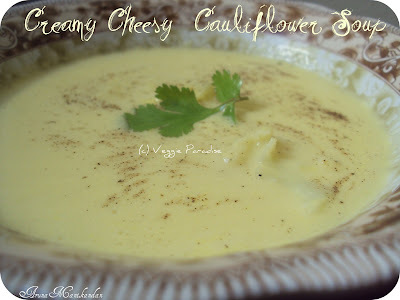 Cheesy ,Creamy Cauliflower Soup as the name says this is definitely a delicious soup. Undoubtedly the kids will love this a lot as we are adding grated cheese in it :). This is a simple soup which has a rich taste. Heat butter/Olive oil in a pan. (I use both), add the chopped garlic and saute , until they turn slightly brown. 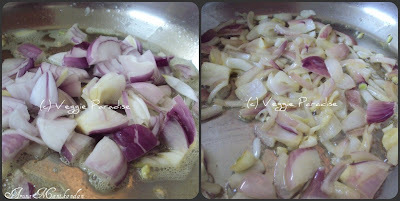 Add the chopped onions , fry them until they turn translucent. 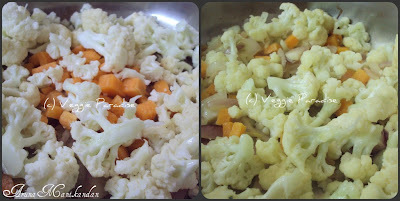 Add the cauliflower florets along with carrots, saute for 2 mins. When the florets get cooked, turn off the flame and allow it to cool. 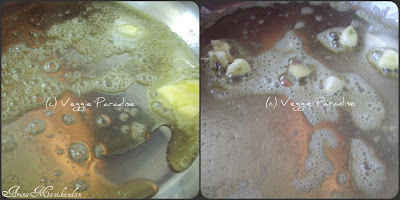 Strain the water,grind them in the blender and filter it(by using the same water). Add this filtered puree in the pan, meanwhile mix the cornflour in milk,along with salt.When the puree starts to boil, add this milk and stir it gently. When it starts to boil, turn off the flame. Finally add grated cheese. If you wish you can add some cooked cauliflower florets in the soup . So healthy and creamy soup !! lovely clicks !! 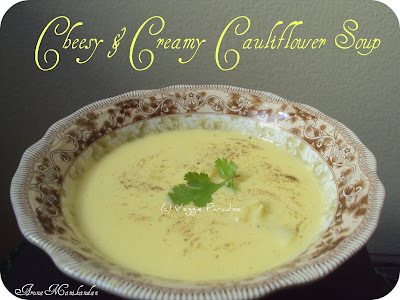 Lovely, creamy and healthy soup.The clicks looks so nice. yummy delicious and nutritious soup. Soup looks definitely delicious and healthy as well. Great recipe. Lovely soup.Lovely picture.Comfort food Aruna. That looks creamy and rich! thanks for sharing! Wat a comforting soup, simply inviting and creamy..
Great flavours and as the tiltle says, creamy and cheesy..
Looks really creamy and delicious; carrots is a new addition. Looks super creamy and rich..Would love to have a bowl right now !! Awesome! 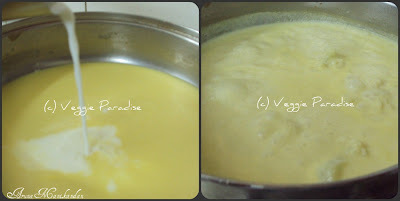 !creamy yummy soup...Great step by step clicks.. Delicious and creamy rich soup. Lovely detailed explanation of the recipe, looks rich and yum! looks rich and creamy indeed ! Yumm! Soup looks very tempting. Rich and creamy soup looks delicious. Great blog. Thanks for visiting and commenting. Keep in touch. iLike! what a delicious recipe. Soup looks so rich and creamy, yet healthy! You have a lovely collection of recipes....happy to follow your posts! 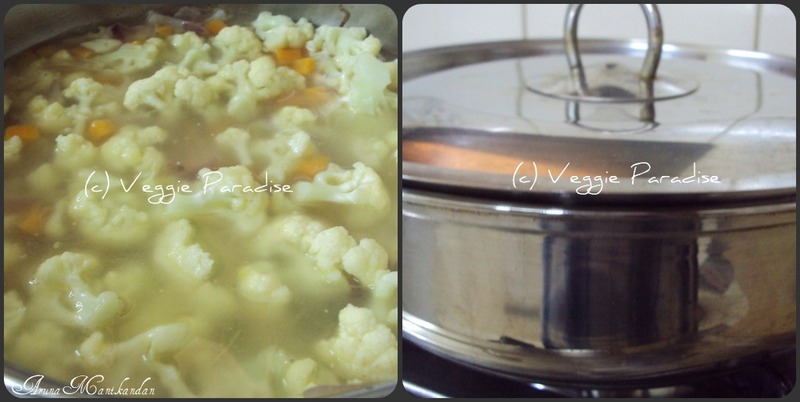 Your soup looks delicious--I love creamy cauliflower soups. Thanks so much for joining in this week at Souper Sundays. Welcome and I hope to have you back again soon. you have got wonderful space!! Cauliflower soup is just fantastic!! new to me! 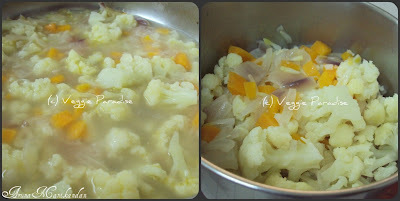 I am seeing a lot of cauliflower recipe these days :) The soup looks so warm and savory. Thats a bowl of hearty and comforting soup..looks so yummy! I love this cauliflower soup - one of my favorites! So delicious! Looks creamy. never had this so far. Nice post.. I stumbled upon your blog. What a creamy soup !!!! I would like to have it with bread. I am happy to follow you. 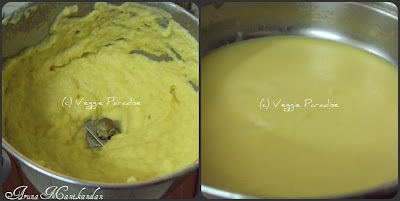 Super recipe Aruna!! I must try this as my hubby doesnt like to bite into a cauliflower, so what better way to still serve it to him than in the form of a soup? Great blog & lovely pics - yet to explore your entire collection, good going! cheers! super soup, Grat cheesy additions too,what more can I want! !